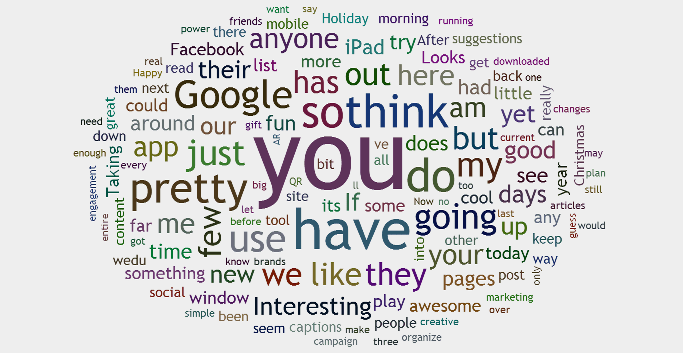 I was scanning my Google+ feed yesterday and found a link to this fun HTML5 word cloud tool. You can enter your Facebook, Twitter or Google+ profiles and it generates a customizable word cloud that displays the phrases and words that you use most in your tweets and posts. You can also create clouds for your website, RSS feed, Wikipedia page or even an uploaded file. 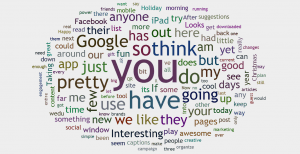 Once generated, your word cloud can be saved or shared socially. Try it out. You may learn something about your social posting habits.